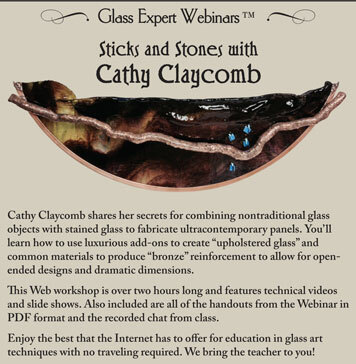 Cathy Claycomb brings new thoughts and ideas to her webinar Sticks and Stones. Learn how to combine non-traditiional glass objects to create ultra-contemporary panels. Her simple tips on fabrication allow you to combine items of irregular thickness into panels of unlimited size. Also, learn how to work with roundels, found items and head glass. Cathy will demonstrate how to use luxurious add-ons to create "upholstered glass". And the most fun of all….Cathy will show you how to take small branches and sticks, cover them in sculptural solder, and achieve a look like hand rubbed brass!!! This is not your mother's stained glass!" Please note that this is a Data DVD, to be played in your COMPUTER. Use VLC Player or RealPlayer, both free on the internet, to play the Flash file of the recorded webinar.